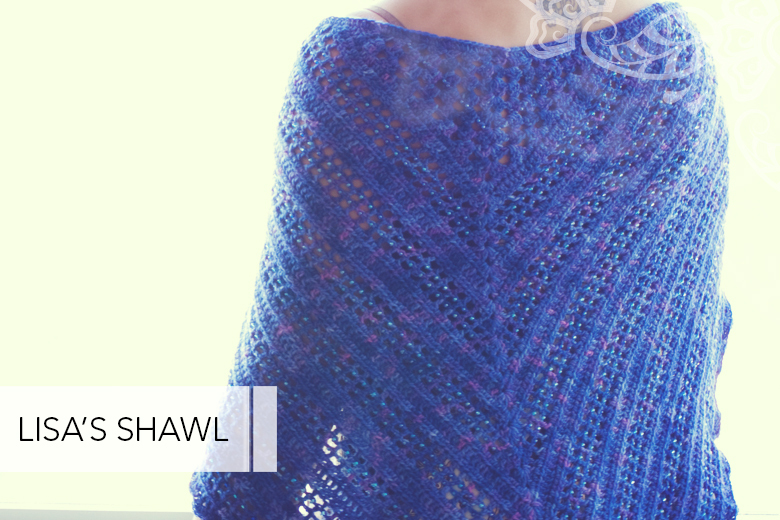 The shawl is worked up using 2 skeins of sock weight yarn. 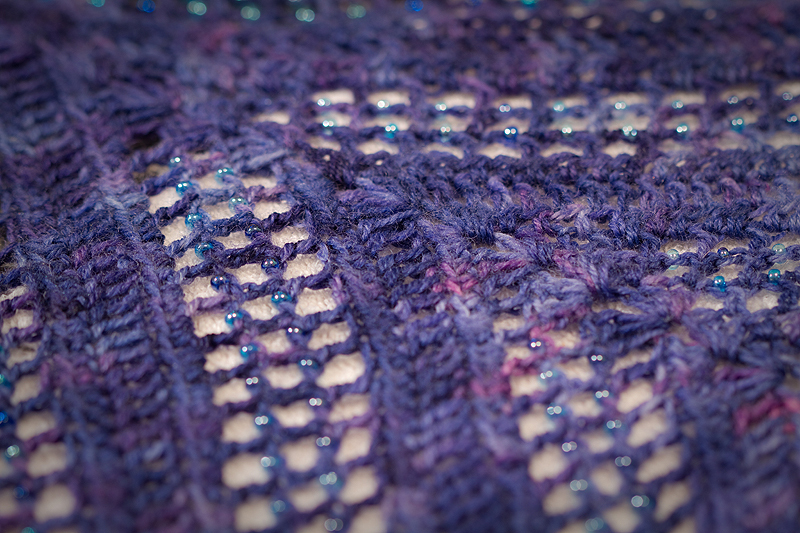 My shawl was done in TFA Blue label Grape, and Lisa’s in Ella Rae Lace Merino, in the whimsically named colourway #117. The beads are easy to add, visible from both sides and add a lovely weight to the finished piece. 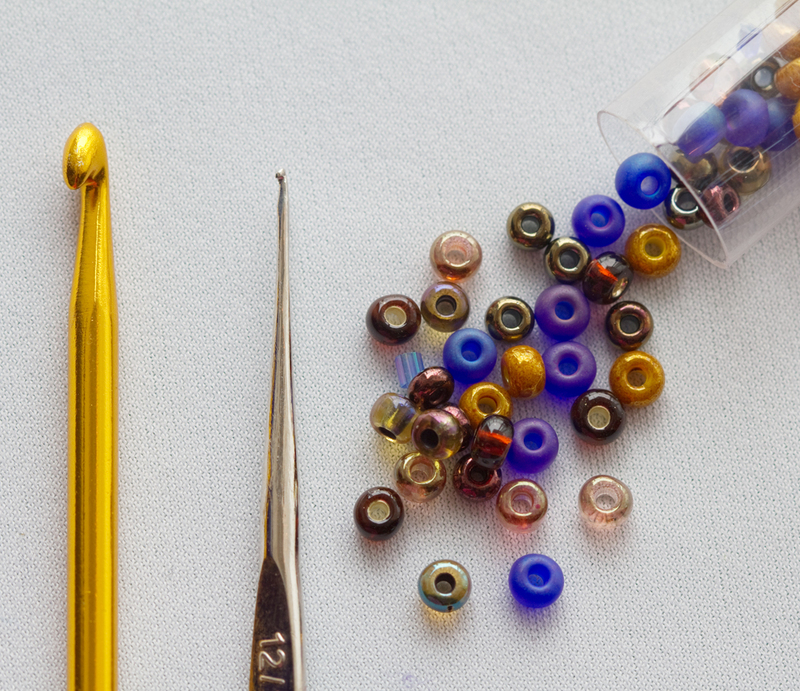 You will need a 3.75mm hook for the main body, a 1.0mm hook for the beads, and about 50 grams of size 6.0 seed beads. You can download the pattern here. Or check out the Ravelry page here.Enjoy! Beautiful! 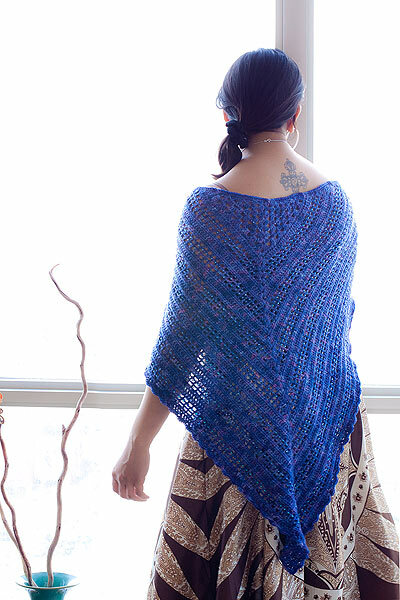 I’ve been wanting to do a beaded crochet project and this shawl is perfect! Thanks for sharing! This is beautiful, I want to make this for my daughter-in-law. She will look so pretty wearing it. Im honoured Bonnie, thank you! I’d love to see photos after if you feel like sharing! I’m very excited to finally be making this shawl but I think I’m having problems with it. This is a stupid question, I’m sure, but isn’t the edge of the shawl (the side that would lay across your shoulders) supposed to be straight across?? Mine is coming out curved and for the life of me I can’t figure out why…..unless its supposed to be like that. I would love to send you a photo of what I’ve done so far so you can give me a thumbs up or a thumbs down. 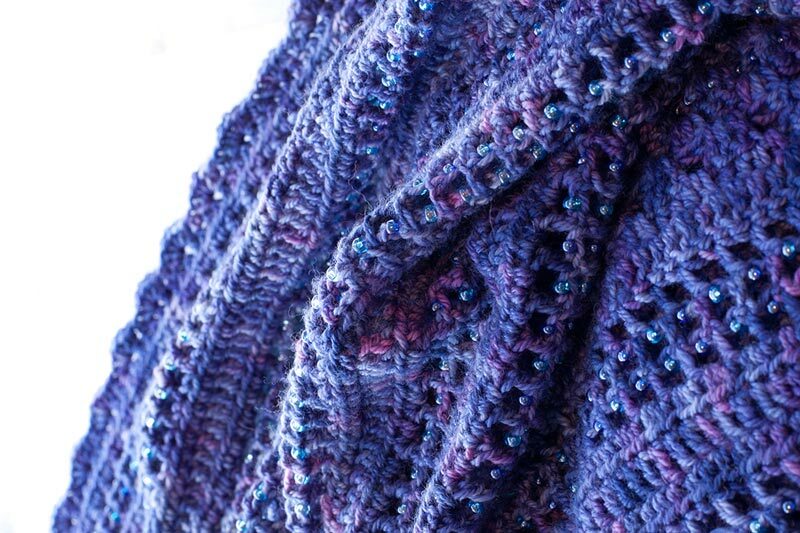 In the photo above, of the blue shawl shown from the back, it looks like you’ve got about 8 rows or so of the granny stitch…..my instructions don’t start like that. Please help me!! I really must have this shawl. I’m planning on wearing it to an upcoming wedding in the Napa Valley, CA which we’re traveling to from the east coast. Please, please!!! sounds tricky ;) Since it’s time sensitive, it might be best if we chat – please email me your phone number at hello@thebluebrick.ca and I’ll see if I can talk you through the problem! I have some of “Vanna’s Choice yarn that is a medium yarn. I want to make this shawl with it. But the yarn is to big to get the beads on it. Have you ever made it without the beads? You can make it in any yarn you like, and it will work out fine, beads or no beads :) good luck! ok here is a REAL dumb question but i am totally stumped! i want to make this pattern – i think its beautiful! HOW in the world do i find the pattern to print it!!! i have all the necessary programs for pdf files but i cannot find a place that says download here or something! Go to this link and the download button will be on right side near top. Go to this link.Download is on right side near top. This is beautiful, and I am going to make one for my daughter. First time working with beads…wish me luck. Thank you soooo much for sharing! 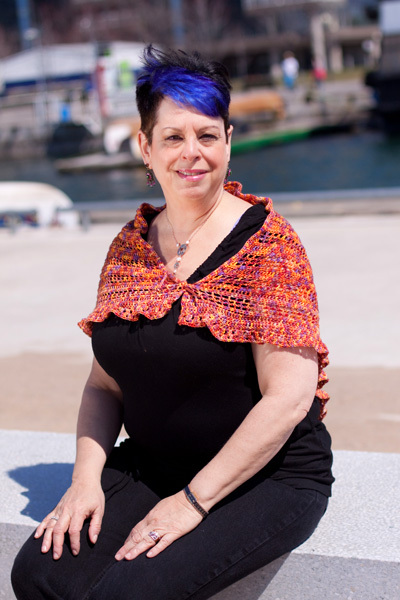 Beautiful Shawl I want to make! This shawl is beautiful and my daughter-in-law asked me to make it for her. Is there a pattern that shows how many stitches are in each row? 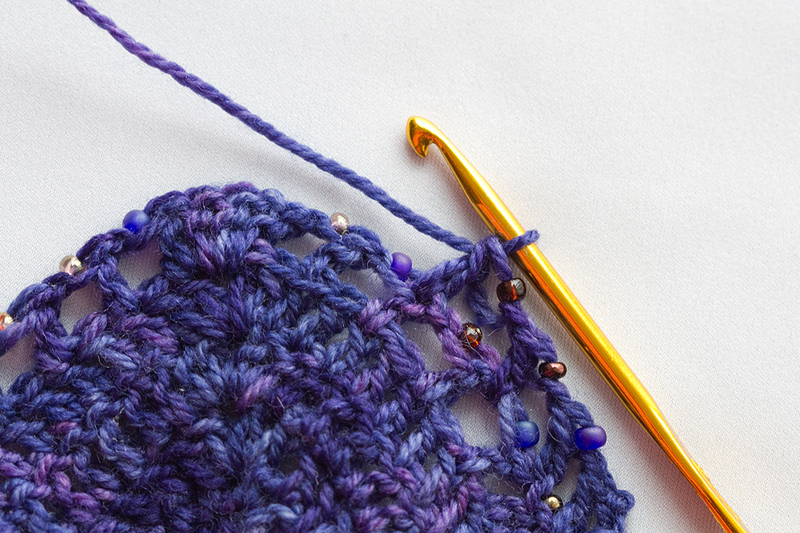 Instructions that show stitches keep me on track by letting me know I’m crocheting the proper amount of stitches. I’m confused on the wording on the setup rows, after having done the 6 sc into the circle and turning the work….then I don’t understand exactly what I’m supposed to be doing. Any advice would be appreciated! Commenting again since I don’t think my first one went through! I’m confused on the row setup: after doing the 6 sc into the circle and turning, I’m not understanding the wording. Any advice would be appreciated!